Raise your hand if you are trying to lose a few pounds? Raise your hand if you need a little help? *waves two hands in the air* SLIMQUICK offers weight loss products specifically designed for women. You have probably seen the commercials on TV that explain how SLIMQUICK works by targeting the top six reasons women have trouble losing weight. SLIMQUICK offers several products designed to give that extra boost towards weight-loss. 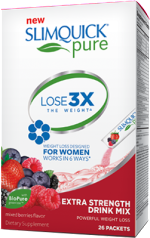 I was given the opportunity to review SLIMQUICK Pure Extra Strength Mixed Berries Drink Mix. SLIMQUICK Pure Extra Strength Drink Mix has isolated the fat-burning component in green tea that speeds up your metabolism. It is called BioPure Green Tea™ and it has been shown in a published clinical study to help overweight women lose 3 times a the weight versus dieting alone, in just 13 weeks. This drink mix uses a combination of natural ingredients, including antioxidants, in conjunction with their BioPure Green Tea to help you create a tasty beverage that supports weight-loss. The packets come individually packaged in a box of 26. When taken according to package directions that's about a weeks worth of product. Packets are 0 calories and are meant to be mixed with water. Since they are individually packaged it makes them easy to toss in your purse to use during work or if you plan to be out during the day. Just pour into a water bottle and shake it up. It is mixed berries flavor and taste pretty sweet but even though I am not big on sweet drinks I had no problem drinking these. The directions suggest drinking after or during a meal and I have to agree. I made the mistake on the first day of drinking on an empty stomach and I felt dizzy and sick for most of the day. I am pretty sensitive to caffeine but if I drink these at the same time that I am eating a meal they do not have the same effect on me. I did not notice that I had a lot of energy after drinking. The directions say not to consume within five hours of bedtime. Again I made a mistake on the first day and did not follow the directions and struggled to fall asleep. What I liked most about SLIMQUICK Pure is that it suppresses your appetite. I literally had to force myself to eat because I was not hungry. This makes it easy not to over eat or binge on unhealthy snacks. In fact we went out for dinner one day, and even though the menu was filled with delicious fattening foods that I would normally not think twice about ordering I settled on a healthy salad instead, and was completely satisfied. After a week of using this product I was down 4 pounds! I know most of this was water weight but it is a great motivator when you step on the scale and see the numbers go down. It gives you the motivation to try harder at watching what your eating and gets you wanting to get up and exercise. In conjunction with healthy eating and exercise I think SLIMQUICK is a great way to help you get started on your weight-loss journey or help you lose the last extra pounds you have been having trouble with. Here is a coupon for $5.00 off your SLIMQUICK purchase! SLIMQUICK products can be purchased in several drugstore nationwide. As well as Walmart and Target stores.